As the pastor looked around the aircraft, it became obvious that many of the passengers were becoming apprehensive. Having commented about the storm and the behavior of the plane, he asked why she had not been afraid. There are many kinds of storms that buffet us. 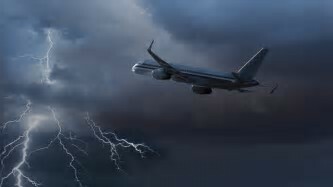 Physical, mental, financial, domestic, and many other storms can easily and quickly darken our skies and throw our plane into apparently uncontrollable movement. We have al l known such times, and let us be honest and confess, it is much easier to be at rest when our feet are on the ground than when we are being tossed about a darkened sky. Let us remember: Our Father is the Pilot. He is in control and taking us home. Don’t worry!